100% Authentic Nanette Lepore. Swimwear in Size S. -Hand Wash. Size Type: Regular. Style: Cover-Up |. U:726419845208|Style:nl5c455|Rep:|schart:yes|Minutes:4|Am:match. Style: Cover-Up. We get great deals from them that we pass on to you! Long sleeve. 100% polyester. I always list all defects and put a picture. Color: Red. Nanette Lepore Swim Cover up Dress. Size: Small. Gorgeous Nanette Lepore swim suit cover up with lovely embroidery and gorgeous coral pink silk fabric. Size is 2. Excellent condition! Really flattering and can be worn as a dress--covers everything up beautifully! Nanette Lepore Swim Cover up Dress. Size: XSmall. 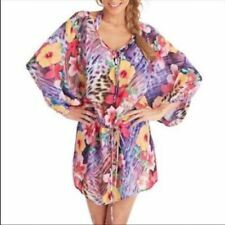 NWT Nanette Lepore Swim Cover up Dress. Size: Small. nanette lepore cover up. Condition is Pre-owned. Shipped with USPS First Class Package. Great used condition. Open Shoulders, Lace up. V-neck with lace up ties. 3/4 length sleeves with cold shoulder cutouts. Fitted from waist down but stretchy. Previously worn but still in great condition! Measurements: length 32 inches, bust 18 inches, hips 19.5 inches Nylon blend Machine washable Comes from a smoke free home Please contact me if you have any questions. I only ship domestically. All sales are final. Thank you for looking and happy bidding! Style - Vneck Coverup Dress Pockets. Size - Large. Navy blue and off-white cover-up shorts. Hand wash, line dry. 70% cotton, 30% silk. Elasticized waistband. New with tags Nanette Lepore Diamond Vines Wamp Printed Off-the-shoulder tunic cover-up. A sophisticated finish for your swim look, this soft tunic from Nanette Lepore is in a chic mix of soft florals and geometric shapes. Flowing sleeves accent the off-the-shoulder silhouette. OUR PROMISE TO YOU. A range of sizes denotes the difference from laying flat to comfortably stretched. 100% Authentic Nanette Lepore. Swimwear in Size M. -Hand Wash. -Self: 83% Nylon, 17% Elastane; Contrast 1: 72% Nylon, 28% Elastane. Size Type: Regular. Style: Cover-Up |. U:726419845215|Style:|Rep:|schart:yes|Minutes:0|Am:match. By the pool, at the beach or you can even take it out for a night on the town in heels, you'll find any and every excuse to wear this colorful and comfy one piece. Pull on Styling. Nylon, elastane (fabric content/care label missing). Minor runs and minor stains near the bottom hem. Last 2 photos. Overall in good preowned condition. Smocked elastic back panel. Ruffle accent top. Manufacturer Style No. Revolve Style No.